At St Mary Abbots we believe that a school uniform encourages the children to take a pride in their appearance. Whilst making life easier for parents as it removes the daily problem as to what the children should wear to school, it also gives the children a sense of belonging and when on School outings makes them easy to identify. Do mark the clothing clearly (including boots) as it is also easy to lose! Children wearing wellington boots in wet or bad weather should bring a pair of shoes to change into while indoors. Other items worn by the children are readily available from leading High Street shops. ​Hair accessories: These must be kept plain and simple. Large hair accessories are not allowed in school. Only stud earrings are permitted. Should your child require a change of clothes whilst at School, she or he will be provided with uniform from the second-hand cupboard. We ask that parents return this clothing back to School as soon as possible, freshly laundered and ironed. Any items of lost clothing may be found in the lost property box which is currently sited downstairs, outside of the Dining Room. 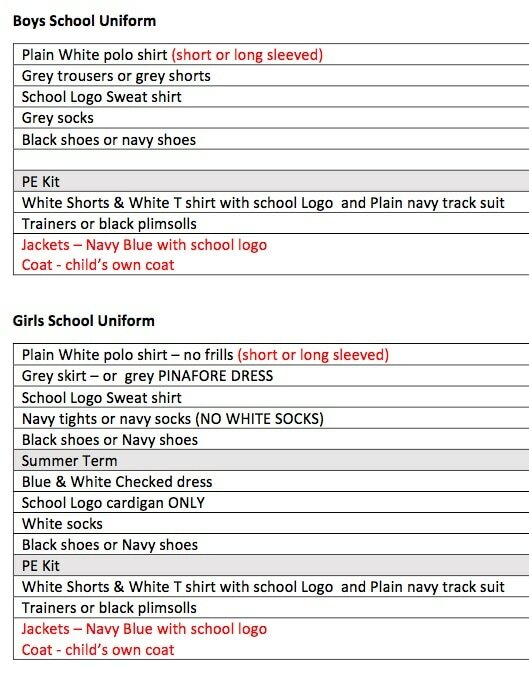 FOSMAS regularly hold Second Hand Uniform sales - please check their website for upcoming dates.